3mm aluminium composite panel (450x450mm) with Class I retro-reflective* markings. *RED for rear and WHITE for front boards, in order to comply with UK vehicle lighting regulations. With corner holes for bungees or screws. Made in the UK. 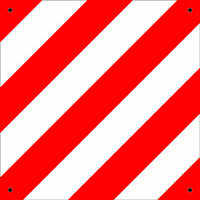 These markers are suitable for use in the UK and most EU states, with some exceptions, such as Italy, where a fully retro-reflective 500x500mm board may be required. These marker boards are to be fitted to front or rear of vehicle, not the sides. by Carrier & will require signature on receipt.